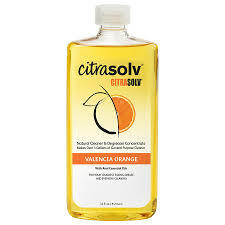 This versatile citrus solvent is a powerful degreaser that cleans your toughest stains while filling your home with the sweet, juicy and delightfully effervescent scent Valencia Oranges. Use it full-strength for especially tough jobs, or dilute it with water to handle most of your household cleaning. Removes chewing gum, grease, tar, lipstick, sap, adhesives, ovens, grills & permanent marker. We've always known how diverse a product Citra Solv is, but many of our wonderfully creative customers have found yet another use for it: as an artistic tool!